A special, one-of-a-kind House of Nines Design hat will be auctioned off during The Crucible's 2012 Fire & Light Soiree on July 21. 'The Crucible is a 501(c)(3) nonprofit arts education organization that fosters a collaboration of arts, industry, and community. Through training in the fine and industrial arts, The Crucible promotes creative expression, reuse of materials, and innovative design, while serving as an accessible arts venue for the general public in the Bay Area. Known for one-of-a-kind industrial arts education programs, The Crucible is also highly regarded for its innovative performances.' -from their website. Here's a photo of the hat from their auction catalog. Because The Crucible focuses on fire-based art (i.e. art made with or from fire, like blacksmithing, glass making, fire sculpture, etc. ), I decided to make a fire-inspired contribution for the auction. 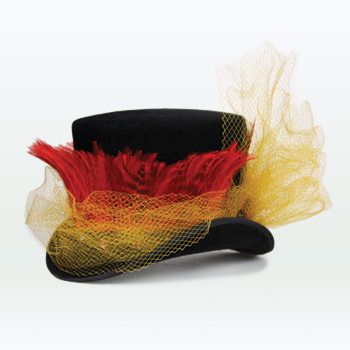 Based on the popular 'Sabrina' mini top hat design, this was made with black velour-finish felt, yellow vintage silk veiling over a layer of red hackle feather fringe, and large antique purple rhinestones. I dyed and then twice over-dyed the feathers with different shades of gold and red to give them a luminous, complex, deep color. This is the only hat that will ever be made in this exact style, so if you want it, you'd better go to the event and bid! Here are lots more photos of all the great stuff that will be on the auction block, from the auction catalog. Help support arts education in the San Francisco Bay Area by attending the event, which will also include a 3-course dinner, fine wines, performances by electric art collective Omega Recoil with Balinese music by members of Gamelan X and Gamelan Sekar Jaya, and lots more art to look at.